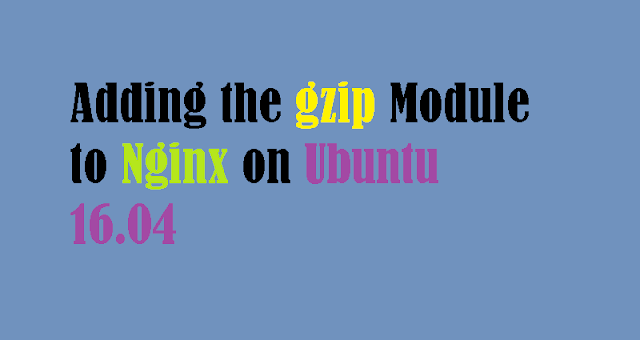 This guide will walk you through the steps to configure Nginx installed on Ubuntu 16.04 server to utilize gzip compression to reduce the size of content sent to website visitors. How fast a website will load depends on the size of all of the files that have to be downloaded by the browser. Reducing the size of files to be transmitted can make the website not only load faster, but also cheaper to those who have to pay for their bandwidth usage. gzip is a popular data compression program. You can configure Nginx to use gzip to compress files it serves on the fly. Those files are then decompressed by the browsers that support it upon retrieval with no loss whatsoever, but with the benefit of smaller amount of data being transferred between the web server and browser. In the following step, we will create several test files in the default Nginx directory to test gzip's compression. Create a 1 kilobyte file named test.html in the default Nginx directory using truncate. The extension denotes that it's an HTML page. The next step is to check how Nginx behaves in respect to compression on a fresh installation with the files we have just created. Let's check if HTML file named test.html is served with compression. The command requests a file from our Nginx server, and specifies that it is fine to serve gzip compressed content by using an HTTP header (Accept-Encoding: gzip). In the last line, you can see the Content-Encoding: gzip header. This tells us that gzip compression has been used to send this file. This happened because on Ubuntu 16.04, Nginx has gzip compression enabled automatically after installation with its default settings. However, by default, Nginx compresses only HTML files. Every other file on a fresh installation will be served uncompressed. To verify that, you can request our test image named test.jpg in the same way. There is no Content-Encoding: gzip header in the output, which means the file was served without compression. You can repeat the test with test CSS stylesheet. Once again, there is no mention of compression in the output. The next step is to configure Nginx to not only serve compressed HTML files, but also other file formats that can benefit from compression. To change the Nginx gzip configuration, open the main Nginx configuration file in nano or your favorite text editor. Add the gzip_min_length 256; directive, which tells Nginx not to compress files smaller than 256 bytes. This is very small files barely benefit from compression. Append the gzip_types directive with additional file types denoting web fonts, ico icons, and SVG images. Save and close the file to exit. To enable the new configuration, reload Nginx. The next step is to check whether changes to the configuration have worked as expected. We can test this just like we did in step 2, by using curl on each of the test files and examining the output for the Content-Encoding: gzip header. Now only test.jpg, which is an image file, should stay uncompressed. In all other examples, you should be able to find Content-Encoding: gzip header in the output. If that is the case, you have configured gzip compression in Nginx successfully! Changing Nginx configuration to fully use gzip compression is easy, but the benefits can be immense. Not only visitors with limited bandwidth will receive the site faster but also Google will be happy about the site loading faster. Speed is gaining traction as an important part of modern web and using gzip is one big step to improve it.